Audi Quattro dominated the most popular motorsports’ event in the history of mankind. Automotive enthusiasts still to this day believe that Group B rally was the most epic event and gave birth to the most iconic cars in the world – cars which went on to become the identity of their manufacturers for as long as the world remains. Audi cashed in the group B rally more than any other manufacturer I presume, but disaster awaited followed with a life-time ban of group B rallying but before the ban, Audi had rumors circling its headquarters about a 1000 BHP rally car for the group B rally. The car was overshadowed by the incident and ban of the group and was forgotten until historians or automotive enthusiasts begin researching about the group B and its demise. The 1000 BHP rally car was and is seen by very few – making it one of the rarest car and Audi. 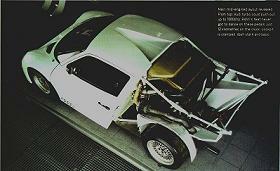 Here are the pictures I have found a lost article regarding the 1000 BHP Audi that you never saw. Click on the images for full-res.